The combination of several pumping impact reports produced over the last few years are presented in a report titled “Colorado River – Simsboro Aquifer Connection.” NOTE: See the final edited report at this link for final text, attachments, and references. There is empirical data that indicates that there may be a significant drain of water from the Colorado River into the Simsboro Aquifer above Bastrop where the river intersects the aquifer. According to an LCRA gain-loss study[i], the Colorado River is a “losing stream” in the segment where the river and the Simsboro aquifer intersect between Austin and Bastrop (Attachment 1). In November 2005 the river was estimated to be losing 9 cubic feet per second, or a loss of 6,516 ac-ft per year (see Table 19-1 from the report). Overall, the Colorado River below Austin has an estimated net gain of 145,000 to 170,000 ac-ft per year as it flows from Longhorn Dam to Matagorda Bay (error of study estimated to be +/- eight percent). The LCRA conducted a similar[ii], but less conclusive study in November 2008 (Attachment 2). The Lost Pines Groundwater Conservation District (District) is responsible for groundwater permits in Bastrop and Lee counties that includes segments of the Colorado River and the Carrizo-Wilcox aquifer group including the Simsboro aquifer. The District’s permitted pumping in the Simsboro aquifer is about 75,000 ac-ft/yr. Several water purveyors have applied for Simsboro aquifer groundwater well permits totaling more than 100,000 ac-ft per year. Previous pumping of the Simsboro aquifer by Alcoa at its mining site was in the range of 23,000 ac-ft/yr from 1990 through 1999. Permitted pumping by neighboring Post Oak Savannah GCD in the Simsboro aquifer is about 100,000 ac-ft/yr. Permitted and potential pumping in the Simsboro aquifer in the two districts is about 275,000 ac-ft/yr. The impact of the pumping described above, by way of the apparent direct connection between the Colorado River and the Simsboro Aquifer, could cause future losses from the river to the aquifer to be significantly greater than the current estimated loss of about 6,500 ac-ft/yr. The impact of groundwater pumping of the Simsboro Aquifer on the Colorado River is of great concern and needs to be investigated, quantified if possible, monitored and managed. Environmental Stewardship, in connection with its efforts to inform the permitting process of the Lost Pines GCD and the desired future conditions process of Groundwater Management Area 12, contracted a groundwater hydrologist, George Rice, to evaluate the impacts of groundwater pumping on the Simsboro and associated aquifers, and on outflows from the aquifers to the Colorado River. Environmental Stewardship hereby submits documentation[v] (Rice’s Evaluation Report) demonstrating that there is likely to be deleterious impacts on the Colorado River and its tributaries and on the aquifers associated with the Simsboro aquifer resulting from baseline pumping and baseline plus potential groundwater pumping (Attachments 3). Rice’s Evaluation Report show that groundwater modeling predicts that there will be impacts on baseflows (aquifer outflows) to the Colorado River and tributaries from baseline and potential pumping of the Simsboro aquifer. Though modeling does not specifically predict quantity of impact on the river, it does predict a trend toward decreasing the amount of groundwater discharges to surface waters. Increased pumping rates predict less discharge to the river when pumping is increased over baseline pumping rates. The greater the pumping rate on the aquifer, the less discharge to the river. 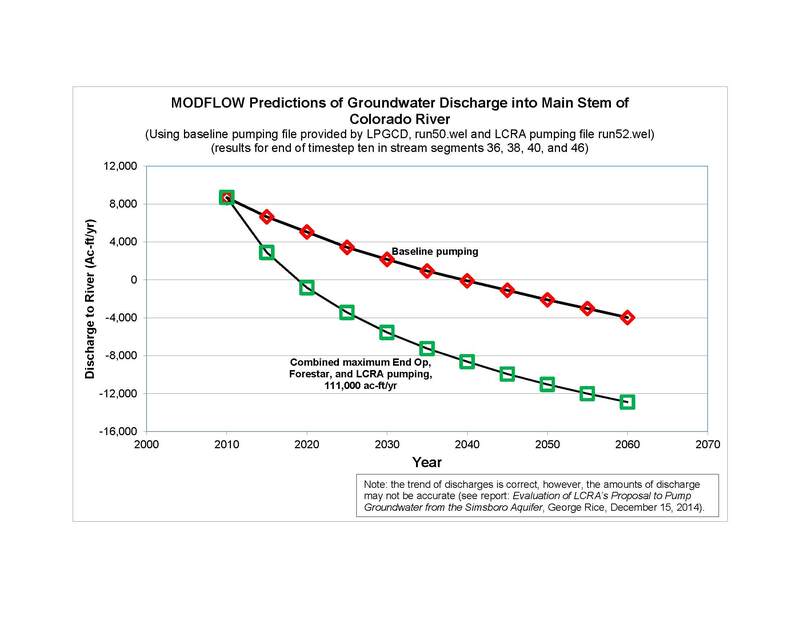 The model also predicts that distance from the river impacts rate of groundwater discharge to the river. Pumping close to the river has a greater impact on discharge of groundwater to the river than the same pumping rate has at a greater distance from the river. Rice’s Evaluation Report predict that potential pumping will decrease the discharge of groundwater to the Colorado River thereby reducing the amount of water flowing in the river. Rice’s Evaluation Report also estimates the combined impact of baseline pumping (existing permitted pumping) and potential pumping on aquifer outflows to the Colorado River. The combination of potential pumping within the district is predicted by the GAM model to have a three-fold impact in decreasing groundwater outflows to the river and tributaries over baseline pumping (See Figure 5 from report). The model predicts a trend where the Colorado River changes from a net “gaining stream” to a net “losing stream” within the 50 year planning cycle. The model predicts that potential pumping accelerates the shift from “gaining” to “losing stream by about two decades when compared to baseline pumping. The predicted trend and the shift to a losing stream have major implications for environmental flows — both instream flows in the Colorado River and freshwater inflows to Matagorda Bay — especially during drought conditions. 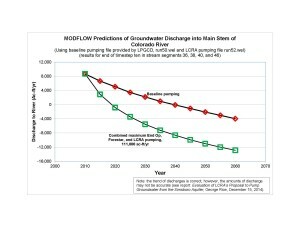 Again, though the model does not specifically predict quantitative impacts, the trends are clear and need to be better understood as groundwater pumping is ramped up over the next decade. The Rice Evaluation Report also shows that pumping of the Simsboro aquifer is expected to cause drawdown in the Carrizo, Calvert Bluff and Hooper aquifers. Rice found that the pumping would create a cone of depression (region of reduced hydraulic heads) that extends to both the confined and unconfined (recharge zone) portions of the Carrizo, Calvert Bluff, Simsboro, and Hooper aquifers and that the pumping would induce leakage from the Carrizo, Calvert Bluff, and Hooper aquifers. Average drawdowns of the aquifers range from 50-692 feet, with a maximum drawdown in the Simsboro of over 1,000 feet (Tables 1 and 2). All of the aquifers in the Carrizo-Wilcox group intersect the Colorado River between Austin and Smithville, but primarily in Bastrop County (See Table 19-1 from LCRA Report). Since the river is a “gaining” stream in most of the segments in this region (except the Austin-Bastrop segment), it is reasonable to expect that induced leakage into the Simsboro will decrease outflows to the river throughout the county thus increasing the likelihood that these other segments will become “losing” stream segments. The dramatic increase in drawdown resulting from the potential pumping (Table 2) will likely accelerate the trend as noted with Figure 5 from the Rice report. Historical records indicated that the Colorado River has gained water from the Carrizo-Wilcox and other aquifer formations as it passes through Bastrop and Fayette counties. Recent studiesindicate that the Colorado River is, and remains, a net gaining river as it passes through the river segment associated with the Carrizo-Wilcox aquifer group. Low-flow studies conducted by the USGS in1918, and a flow-duration curve generated by Dutton, in 2003[ix] indicate that these groundwater formations have contributed a net flow of approximately 25,000 acre-feet per year to the Colorado River. More recently, the Lower Colorado River Authority (LCRA) conducted studies, discussed earlier, to assist in its management of water releases from the Highland Lakes to meet water rights and environmental flows obligations (LCRA Operations). These studies include information on the gains/losses of the river as it flows through Bastrop County and provide additional quantification of the amount of base flow the river gains during drought periods like the one that has occurred over the past several years. In a study related to the LCRA Operations Project (Saunders, 2006; Reference 1) the author concluded, “the lower Colorado River is a gaining stream that receives groundwater contributions from major and minor aquifers.” Analysis of USGS data contained in the report, though inconclusive, shows a gain of about 50 cubic feet per second (cfs) in the reaches passing over the Carrizo-Wilcox between Utley and Smithville (about 99 acre-feet per day). Limited fieldwork in 2005 also suggested that, thought the Colorado River has some stream flow gain from groundwater in these reaches, there is a losing segment in the reache associated with the Simsboro Aquifer. We are in danger of impacting the river system below Austin in a manner that will result in a dramatic decrease in the contribution of groundwater outflows to the river in the lower basin and inflows to Matagorda Bay. This situation will become even more critical as environmental flows to Matagorda Bay are held back by the LCRA approved Lane City Off-channel Reservoir Project. Ecologically speaking, a river is an ecological system and needs to be managed on an ecological basis to ensure that ecological service functions (such as the groundwater-surface water connection) of the river that provide flows are not severely reduced or damaged. The impact of groundwater pumping of the Simsboro Aquifer on the Colorado River is of great concern and needs to be investigated, quantified if possible, monitored and managed. As the current drought continues, we may have a very rare opportunity to conduct gain-loss hydrologic studies on the lower Colorado River during this period of severe drought and historic low flow conditions resulting from the curtailment of irrigation water for rice farming. The information collected as part of the study could be used to assist in the calibration of groundwater availability models. Attachment 1: Saunders, Geoffrey P. February 2006. Low Flow Gain-Loss Study of the Colorado River in Texas. TWDB Report 365, Chapter 19. Table 19-1 with calculations to convert cubic feet per second (cfs) to acre-feet per year. Attachment 2: Saunders, Geoffrey P. February 2009. Low-Flow Gain-Loss Study of the Colorado river in Bastrop County, TWDB Report 374, Chapter 8. Attachment 3. Rice, George. February 2015. 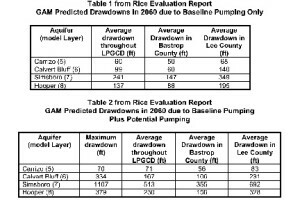 Evaluation of Drawdowns Resulting from Baseline Pumping and Potential Pumping from the Simsboro Aquifer in Bastrop and Lee counties, Texas (Rice Evaluation Report). [i] Saunders, Geoffrey P. February 2006. Low Flow Gain-Loss Study of the Colorado River in Texas. TWDB Report 365, Chapter 19. Table 19-1 with calculations to convert cubic feet per second (cfs) to acre-feet per year. [ii] Saunders, Geoffrey P. February 2009. Low-Flow Gain-Loss Study of the Colorado river in Bastrop County, TWDB Report 374, Chapter 8. [v] Rice, George. February 2015. 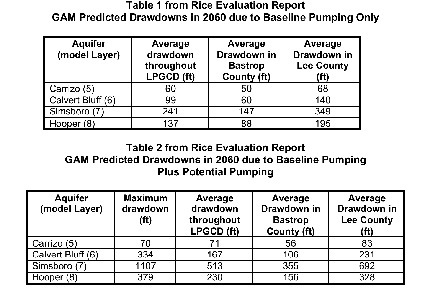 Evaluation of Drawdowns Resulting from Baseline Pumping and Potential Pumping from the Simsboro Aquifer in Bastrop and Lee counties, Texas (Rice Evaluation Report). [ix] Dutton, Alan R., Bob Harden, Jean-Philippe Nicot, and David O’Rourke. February 2003. Groundwater Availability Model for the Central Part of the Carrizo-Wilcox Aquifer in Texas, Appendix B – Surface Water- Groundwater Interaction in the Central Carrizo-Wilcox Aquifer.